ISP Marl GmbH is a German subsidiary of Ashland Inc. and a major producer of chemical products based on acetylene. Acetylene, which is produced from liquefied gas by electric arc pyrolysis, is first of all converted with formaldehyde to 1,4-butynediol, which is then catalytically hydrogenated. Tetrahydrofuran (THF) and water are obtained from the saturated diol in the presence of catalytic amounts of sulfuric acid. This mixture is subjected to a multistage rectification process at different pressures (Fig. 1). THF is important as a solvent for polymer and adhesive materials, and is also used as a precursor of the fiber intermediate polytetrahydrofuran (polytetramethylene ether glycol). With an annual production capacity of 36,000 tons of THF and 100,000 tons of 1,4-butandiol, ISP Marl is one of the largest producers in the world of these interim products. Leveraging Yokogawa’s operational performance program (OPP) benchmarking service, the IPS Marl plant successfully identified the causes of excessive manual interventions, stabilized the process, and reduced operator stress, thereby improving the safety and reliability of plant operations. The distillation process on the THF production line, which has been operating since 2008, regularly posed complex challenges for operating personnel, placing excessive demands on the automatic control system and frequently requiring manual interventions (Fig. 2). 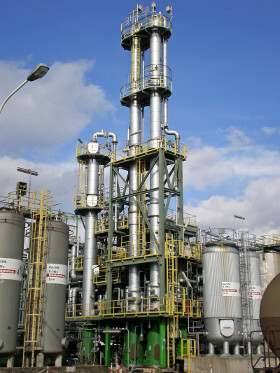 "The plant operator in the control room couldn't take his eyes off the columns for one minute because crucial parameters had a tendency to change without warning, and you never knew whether the next aberration was going to cause one of the columns to exceed the permitted tolerances," shift manager Andreas Hesker explains. Getting back to normal afterwards was generally difficult and time consuming. In the first project phase, such qualitative statements needed to be quantified in order to facilitate a more detailed analysis. This was in keeping with NAMUR recommendation NE 152, which stresses the relevance of "robust and meaningful figures and information" for successful controller performance management. For several weeks in spring 2013, process data was collected from the control system and the plant information management system (PIMS) as a starting point for benchmarking by Yokogawa. "We also had around 500 anonymized data records from plants all over the world, and used this data to select comparable plants for the benchmarking study," says Ralf Tormöhlen, a sales and marketing manager at Yokogawa. The findings confirmed the owner's suspicions: setpoints and manipulated variables needed adjusting with above-average frequency, and in many cases over and over again. It was often necessary to switch between automatic and manual mode, namely about 65 times a day per operator (Fig. 3). 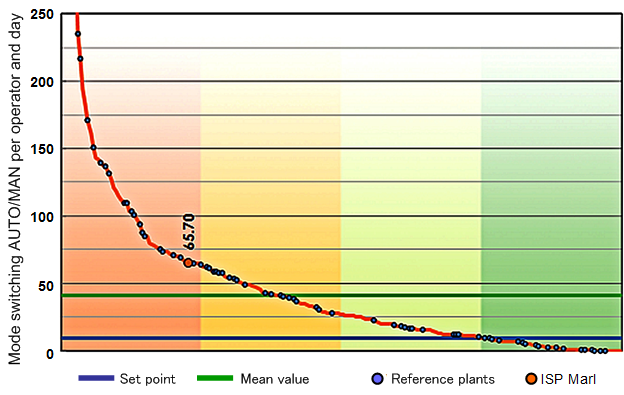 The mean value for all relevant reference plants was in the region of 40. The statistical target value – the border between the first (best) and second quartiles of all reference plants – was 10. Other groups of parameters, which, for instance, allow conclusions to be drawn regarding alarm behavior according to EEMUA 191, controller usage and behavior, control loop performance, and plant operability, are also determined as part of the OPP benchmarking procedure. However, in this concrete case the results were inconspicuous. 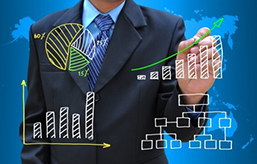 OPP benchmarking involves more than just a comparison with other plants. It also provides valuable support in the search for the causes. "Behind every performance value is a list of so-called 'bad actors' – in other words, tags that contribute disproportionately to the results obtained," Mr. Tormöhlen continues. It was noticeable that some tags came up over and over again (Fig. 4). Put another way, a relatively small number of causes – which may also be interdependent – were responsible for the plant's behavior. All in all, these handfuls of tags were giving rise to between a quarter and a third of all interventions, or up to 100% in the case of repeat interventions. "Based on these findings we decided in August 2013 to identify potential areas for improvement together with Yokogawa," recalls Dr. Andreas Pruß, the butanediol plant manager. "On a previous occasion back in 2012, we had achieved excellent results in optimizing the alarm situation, courtesy of Yokogawa's systematic approach. Good ideas from external partners can be very useful for this kind of project," he adds. 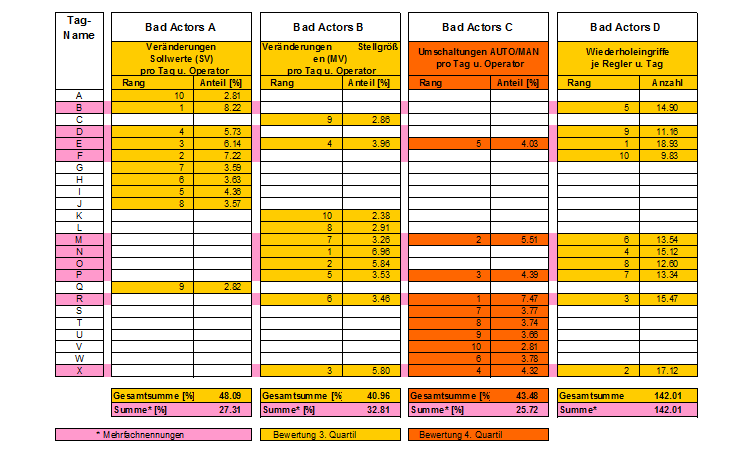 An in-depth analysis of the bad actor tags with the aid of the operating personnel is generally a good point of departure for the improvement process, bringing together process and methodological competencies. This is in keeping with NE 152, which recommends enlisting process, plant, process control element (PCE), and possibly also advanced process control (APC) competencies in all such projects. Dr. Hong Lin, a control systems expert at Yokogawa, took up this thread with the customer's specialists in spring 2014. Dirk Püthe, head of electro & process control at ISP Marl, emphasizes: "In particular, we were loath to disrupt – or worse, interrupt – production. All planned changes were therefore discussed in detail upfront and their impacts analyzed." Dr. Lin: "The operating personnel made a vital contribution to the success of the project. Without their perseverance, for instance, when scheduled excursions from normal operation were carried out for weeks on end – often during the night shifts – we would never have been able to understand all the ins and outs of the controller performance." It was precisely these step responses that Dr. Lin needed: first of all to optimize the regulatory controls using her calculations, and then to gain insights into the influence of disturbance variables. This analysis led to numerous changes, mostly in incremental steps to avoid endangering the production processes. According to Dr. Lin, this strategy of successively moving toward a viable solution demanded considerable commitment and patience from all stakeholders. 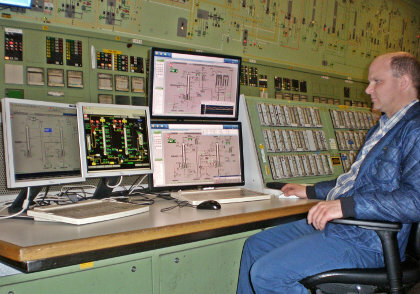 Franz-Josef Löchteken, an electro and process control technician, admits: "I sometimes felt guilty about burdening our plant operators with so many different tests." The ability to control the mass and heat flows in the distillation stages plays a key role. The complexity of these flows is clearly visible in the process diagram (Fig. 5). For example, the condensation heat from the low boilers in the main column is principally used to heat the side column. At the same time, the return flow into the main column has a crucial influence on the column's heat balance. The air cooled heat exchangers in the two columns constitute a bottleneck: their performance varies greatly according to the outdoor temperature and is hence dependent on the weather and the time of year. Finally, the nitrogen that is metered into the main column has important repercussions for the temperature at the column head and, as a result of this, for the separating efficiency. "It became clear as the project progressed that we'd need more information about certain points in order to improve our understanding of the process," Dr. Lin continues. Temporary measurement points were set up for this purpose, for instance for the nitrogen flow into the main column (Fig. 6). "This parameter is measured constantly, as is the outdoor temperature. The latter essentially determines the performance of our air coolers, which is why it's also included in a control loop," Mr. Püthe comments. 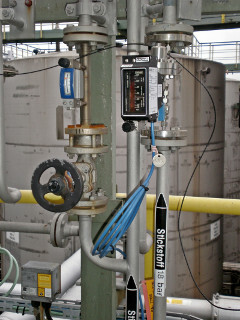 A simple and affordable wireless solution was realized for some of the temporary measurement points. Since no wiring is required either to transfer data or to supply power, these sensors are easy to install and subsequently remove again, which is a big advantage if the optimum measurement points have not yet been identified. The project was successfully wound up in October 2014. "There's now far less stress for our plant operators on the THF processing line. That definitely used to be a short-straw job, but not anymore," Mr. Hesker asserts. Apart from extreme weather scenarios such as storms, where the temperature can alter dramatically, the plant operates far more stably today. This is also confirmed by the fluctuation profiles for key process parameters (Fig. 7). "The process usually returns to normal automatically after a weather induced excursion. It's only load changes that still require extra attention," Dr. Pruß remarks. The startup process has likewise been made much easier using simple means. Many operator interventions are now superfluous thanks to a ramp function. Mr. Püthe is very happy as a result: "We've found a reliable but nevertheless affordable solution that really takes the heat off our operating personnel and tangibly reduces the risk of operator errors. We're confident that our customers will take a similarly positive view of this increase in our production and delivery reliability." Mr. Löchteken would like to see it followed up by a further optimization cycle: "Controller performance and interdependencies are far more transparent than in the old days. The next improvement step will almost certainly enable us to handle even more situations in automatic mode." 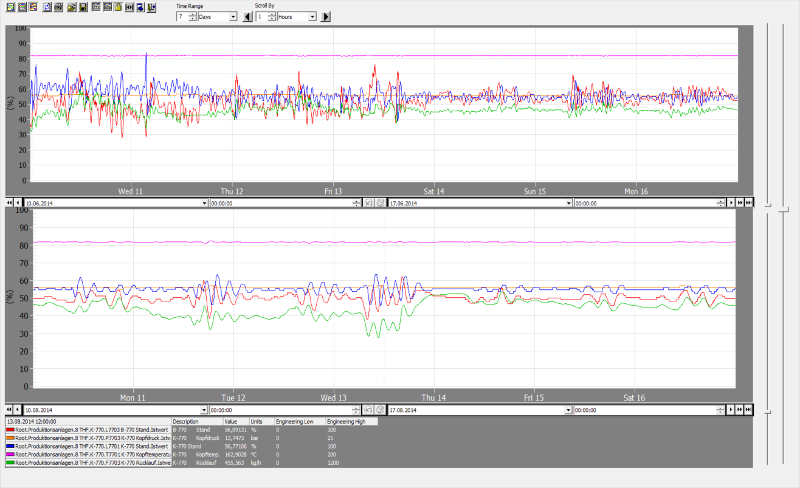 PID control plays a fundamental role in process control. 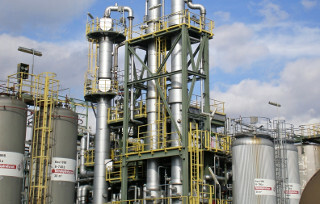 Proper setup and tuning are required for stable plant operation and are a prerequisite for advanced process control. Yokogawa provides a standardized approach to the implementation of regulatory control stabilization with fixed procedures and methods that ensure optimum and safe plant controls. Integrate big data to optimize plant data and develop optimal setpoint targets with real-time optimization.